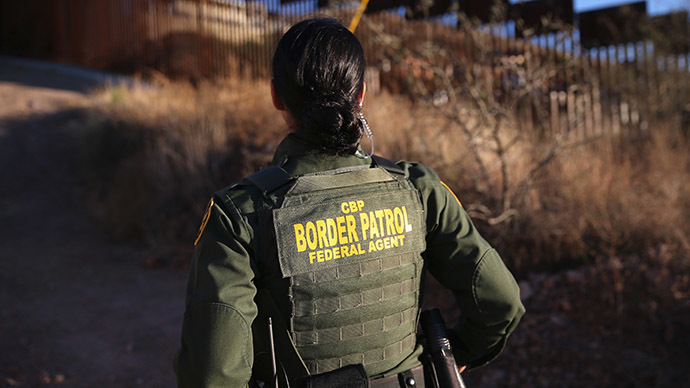 As congressional Republicans try to undo executive actions regarding immigration this week, a new report shows that US Customs and Border Patrol (CBP) agents are quietly being trained not to arrest undocumented immigrants. While the guidelines are careful to note that agents should not construe the training as discouraging arrests, the documents appear indicate that CBP agents “should primarily only arrest someone who they directly see cross the border, if they are a wanted criminal, a convicted felon, have an extensive or a violent criminal history, or otherwise pose a national security or public safety threat,” according to Breitbart. The training guidelines aren’t the only government documents discouraging arrests, however. Secretary of Homeland Security Jeh Johnson issued a memo on November 20 titled 'Policies for the Apprehension, Detention and Removal of Undocumented Immigrants,' as well as one called 'Secure Communities.' Both were issued the same day President Barack Obama took executive action to extend a deportation reprieve to 5 million undocumented immigrants. In the November 20 Policies memo ‒ which was directed to US Immigration and Customs Enforcement (ICE), CBP and US Citizenship and Immigration Services (USCIS) ‒ Johnson outlined “clearer and more effective guidance” when it comes to prioritizing threats to national security, public safety and border security, as well as “greater transparency” in annual reporting of removal statistics. While DHS may exercise prosecutorial discretion at any stage of an enforcement proceeding, it is generally preferable to exercise such discretion as early in the case or proceeding as possible in order to preserve government resources that would otherwise be expended in pursuing enforcement and removal of higher priority cases. Thus, DHS personnel are expected to exercise discretion and pursue these priorities at all stages of the enforcement process ‒ from the earliest investigative stage to enforcing final orders of removal ‒ subject to their chains of command and to the particular responsibilities and authorities applicable to their specific position. The DHS secretary also specifically outlined what types of immigrants and illegal actions made up each priority grouping. Meanwhile, the House of Representatives is likely to vote this week on a plan to defund Johnson’s department through September, while rolling back Obama’s executive action on immigration, Politico reported. The lower chamber’s vote would also include Obama’s 2012 executive action that delayed deportation for young undocumented immigrants through a program called Deferred Action for Childhood Arrivals. The 2014 version created a similar program for undocumented parents of children who are in the country legally. The secretary also noted that governors, mayors and law enforcement officials around the country have refused to cooperate with Secure Communities, while a number of federal course have also rejected the authority of state and local law enforcement agencies from enforcing the program. The legislation, expected to easily pass the House, is not likely to pass the Senate, despite its new Republican majority, according to Politico.